Just back from a week in Vermont, baking under the tutelage of Jeffrey Hamelman, I was itching to get into my own kitchen and fire up the oven. But, what to make? We were going to have chicken gumbo for dinner the following day, so I chose a simple rustic bread. I had enough time for a preferment... check. I had the right flours... check. Okay, off to a good start! I only wanted to bake two one-pound loaves, so I got out the calculator to scale everything to 1000 grams of dough---a nice round number (a little more than two pounds, I know, but I always lose some to the mixing bowl). Baker's math? Please. "It's no hill for a climber," as my husband would say. After all, I'd been crunching numbers for a week. I was ready. I mixed the pate fermentee and parked it on the counter to ripen overnight. Even though I had doubts about the calcutaled yeast amount, it matured right in the middle of the 12 to 16-hour window. Things are goin' really well. Next up was figuring out the right water temperature for the dough to end up at 75ºF. But I don't really know the friction factor for my mixer, because it increases with mixing time. And my mixer doesn't follow the usual so-many-minutes-on-first-speed, second speed and so on, because it's not a KitchenAid or any of the usual mixers. I decided instead to wing it this time with cool room-temperature water, and calculate the factor for next time, from whatever temperature the dough turned out. The dough finished a little warm---81º---so I spread it a bit and let it sit on the granite for a few minutes to bring the temperature down to 75º. Still on track. I watched as the loaves started to spring, and then left the room for a few minutes. When I came back to check on them, one had bloomed quite nicely, but the other was struggling. They both looked the same going into the oven... I was vexed. Did I not cut deeply enough? The stone had preheated for more than an hour. There was plenty of steam. The crust was coming along beautifully. Maybe the universe just decided that I was getting a little too cocky. The loaf on the left bloomed, the other not so much. They sounded like a bowl of rice crispies once out of the oven. Is cracking like this during cooling a desireable thing or a defect? From the bread on the left in the oven shot, above. The one on the right---not quite as open on the inside, either. No surprises there. There was one thing in particular that puzzled me. This doesn't happen every time, but whenever it does, I've noticed it always seems to be the loaf on the right that doesn't open well. That can't be just a coincidence, can it? Time to put on my investigative hat. What do I have here to examine---two loaves of bread and an oven. The loaves were the same going into the oven, but different coming out. What happened in there? I picked up each loaf to take a closer look. The crust looked about the same from one to the other... until I turned them over. The bottom on the loaf that failed to bloom was a little lighter than the top, and the bottom of the bigger loaf was a little darker than the top. They looked very different. Interesting. So here's my oven setup. What's wrong with this picture? I preheated the stone to 450ºF. And what's the temperature of water when it's converted to steam? Less than half of that. And where does steam go when left to its own devices? Up. See where I'm going with this? A good amount of steam rises up under the right side of my stone, sucking the heat out from under the loaf on that side. But not every time. Just when I remember to turn off the convection fan right away. When I forget for a few minutes, the fan diverts it away from the bottom of the stone until the steam stops billowing out of the pan. It all makes perfect sense.... now. Your loaves turned out real nice! Desirable is how I see the crackling and in the case of my kitchen the crackling is also elusive. As for the detective work on the two loaves, I just love it when I get to learn from others and this is a perfect example. While I have not experienced this exact scenario I will remain vigilant to the possibility. Debra, what was the most important thing you learned (about bread) while in Vermont? You may also wish to consider the effect that (excess) steam can have on slashes properly blooming. Certainly your setup has the potential to produce some differential in the amount of steam across the stone. I have seen some lack of proper blooming when I steam too enthusiastically. As I have been told "Everything must be perfect." I thought about that too, but the crust was nice and crisp, and I've been steaming this way for a while now. It was the stark contrast in the color of the bottoms that really told the story. I wish that I had taken pictures of that too, but I wasn't thinking of posting about it at the time. How nice to be able to spend a week with Jeff Hamelman. That must of been fun. I hope you will tell us about the nuggets you gathered in class. Another thing to consider in the uneven heating is that the rear fan creates a rotating air flow swirling unevenly around the chamber. I'd guess that you could prove this by attaching streamers to the cage in front of the fan and observing the pattern, with the heat off or very low. On a tail wheel propeller airplane, the air rotates around the fuselage and applies pressure on one side of the rudder sending the tail off to the side. The pilot can control this with the rudder. If you can see the air flow, maybe you can hang a deflector plate to redirect the air. It was fun. It took me back to working in the clinical laboratory setting, because there are so many parallels. The professional course is geared toward production baking, so is in large part about efficiency and timing to keep the oven full and the bread ready to deliver on time, in the same way that I had to keep my intruments loaded and running patient samples in order to get the workload done and results reported out for rounds. There are a lot of tasks to juggle to make either happen successfully. 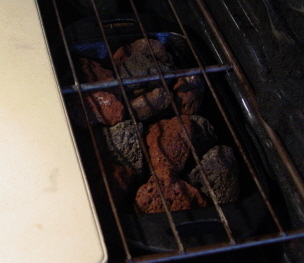 I've abandoned lava rocks in pans, in favor of a sheet pan (11" x 17") lined with a wetted towel. I put it in the oven, on the rack below the one holding my preheated stone (14"x 20") about 5 mins. 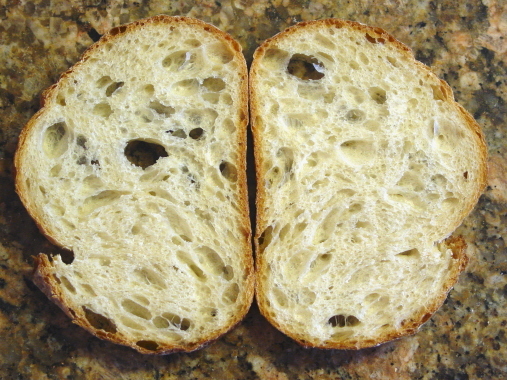 before loading the bread. Like you, I pre-heat in the convection mode, and turn it off (a recent change) just before loading. I remove the pan after the prescribed 10 or 15 minutes, remove the towel covering the oven vent, and restore the convection mode. 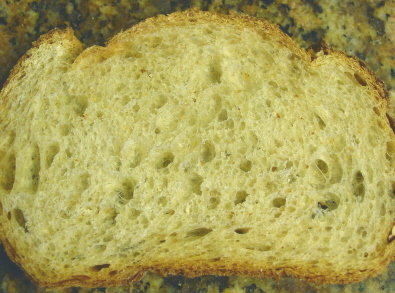 The fan vents the remaining steam quickly, and the bread finishes in a dry oven. I'm more pleased with this approach, than the lava rocks I previously used: it's safer, and I can remove the steam quickly, after it's done its job. If you have, or can borrow an infra-red pyrometer, you can scan the surface of your baking stone to assure you've solved your uneven heating problem. I found the idea for the wetted towel, I thought, in Hamelman's Bread, but I can't locate the page now. I get mostly great results with cast iron and lava rocks, but I'm going to keep the towel trick in mind---thanks! Thanks for the interesting post, Debra. Your loaves look great anyway, and a terrific thing about baking is that we get to eat the not-perfect-looking ones as well and they taste just as good. Over the years, I have noticed much the same effect, as well as the slash bloom issue referred to by proth5. Since it's all but impossible for us home bakers to produce steam that won't lower the temperature in the oven, it seems inevitable that there will be a tradeoff between the expansion of the loaf, the crumb appearance, and the steam. When I am after the translucent crumb and the heavier more chewy crust, I go with the steam and sacrifice cell structure in the crumb. I don't mind. Sometimes I think there can be too much emphasis on holes and height among some home bakers. I've enjoyed and learned from your technical posts, by the way. The parts I could understand, that is. 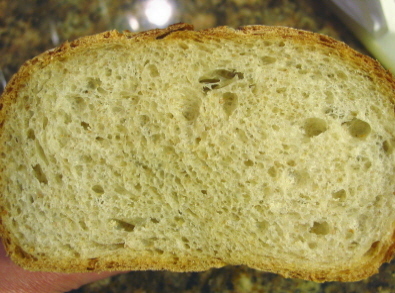 We read about steam and the effect it can have on our breads, but I've never seen such an excellent side-by-side comparison depicting that effect, not only on the crust, but the crumb. Thanks very much, Debra. I have a similar setup in my natural gas (nonconvection oven), with my 17-inch stone sitting on a 24-inch oven rack. Half my steam pan is under the stone and I've often wondered how efficient the setup was. After viewing your photos, I think it's time to experiment and wander around the thrift stores to find a couple of old metal loaf pans, so one can be placed on each side of the stone. You asked if the cracking during cooling was desirable. There are some TFL folks who quest after that cracking and how to achieve it has been recently discussed in some of the blogs. Yours resembles color plate No. 17 of Bread, albeit lighter. Your bread is lovely; am glad it serenaded you. 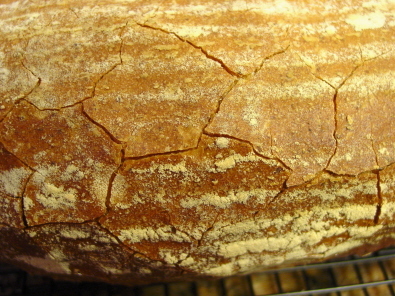 Oh, thanks for directing my attention to the photo---that makes me feel better :-) What I like about cracking, is that it tells me the crust is very crisp. Ideally, I'd like to get my steam pan out from under the stone too. I think that will eliminate this issue altogether. To be able to put it on the same shelf, side-by-side with the stone would be great. Those are both great looking loaves and I'm always happy when my crust cracks like your does. I wish I could do it on a consistent basis but it's more of a rare event for me. Maybe this is a dumb question but I am led to wonder why you don't center the stone and the steam pan in the oven instead of having them offset? Wouldn't this lead to more even heating and steam flow around the stone? Or are you worried about all the steam coming up driectly under the stone? Just wondering. The steam needs to be above the stone, enveloping the loaves, so I want to give it the most direct path I can. It does no good below the stone, and in fact seems to do harm in cooling it. Remember that the steam leaving the pan is 212F---that's 248 degrees cooler than my stone was. If I were to center the stone over the pan, that would just catch more of the steam and make things worse---and probably ruin the spring on both loaves instead of just the one. The other reason is one of practicality. If the pan were centered under the stone, I wouldn't be able to pour water into it without pulling out the shelf. By the time I get the shelf (carefully) pushed back into place, half the steam will escape into the room. This way, I can pour directly into the pan, through the shelf above, and shut the door. When I use steam, I preheat a brick along with my tiles. When the time comes, I place the brick in a large roasting pan, put it on the floor of the oven, and pour boiling water over it. This produces enough steam to last for 10 minutes or more. The steam finds its way around the tiles to the bread, all the while also rising to the tiles and bringing their temperature down. I suppose one could put the roasting pan above the rack with the tiles to see what would happen. No matter what, though, it seems clear that steam will have its effect in a home oven. If you parked the stone over the rocks on the right side? I think you will see an improvement. Check out my answer to occidental, above. I teach a slightly different DDT calculation to the one common in the USA. It may be useful to you in regard to calculation of your friction factor. I think, whatever, to calculate what I label as FRH [frictional heat rise] there is always a necessity to wing it! Here is my method, note I move the FRH over to the other side of the formula. 4 [DDT - FRH] = Pre-ferment T + Air T + Flour T + Water T.
Water Temperature should be 8*C.
Additionally, I also read Jeffrey Hamelman's fantastic little story on pp385. Obviously I convert this to *C, as we don't use the Fahrenheit currency over here anymore [well, I don't anyway, given I want to teach bakery courses that are "current"]. I find this more user-friendly, and I have several different types of dough mixer in my bakery classroom, and they all have different friction factors. Hope this is of some use to you. I long to bake with Mr. Hamelman. I identified this as my dream wish for the year in my Performance Management Review recently. One day! Thank you for the alternate calculation, Andy. Looks like all the same factors I used, only rearranged ever so slightly. I'll see how they compare. Alison and I have had a "vision board" going for some months now! I've just pinned a photo of Jeffrey Hamelman from KA website right to the middle of our board! No, I'm so aware I won't be sorry. Only trouble is that the state of the UK economy has hit Education very badly; especially Colleges of Further Education. Working conditions which were renowned for being generous and favourable 25 years ago are increasingly abominable and insulting. Still, I did get the first year of my MSc in Food Policy funded; no idea what will happen next year when I need that covered too?? Yes, all factors in the formula are the same; I just find it more helpful to move the friction factor over to the other side of the equation. It requires care to lead my students correctly here. I love all the American Artisan baking texts and have them all in our College library and encourage students to really delve into them: Wing and Scott, Reinhart, Hamelman, Leader, Glezer, Ortis etc. they're all there. But this DDT calculation is the one used by the English plant bakers. It's the method I was taught when I did my own Bakery quals, so it's the one I pass on to my students. I just have to be careful to make sure they don't get confused when they come across the alternative calculations....and, of course, they do!! Thanks for all your postings. Your breads are stunning. I hope you dont mind if I pick your brain a bit. You mention you dont use a regular mixer and was wondering what you used. Looking foward to hearing from you.. I have two mixers that I use for bread dough, depending on how much I'm making. Small batches, I just throw into my Zojirushi bread machine. I like the Zo because it does an excellent job kneading and developing gluten (especially whole grain) without incorporating a lot of air that oxidizes dough. And it's easier to clean up than a stand mixer. However, I use it as mixer only, and not as a bread machine. I have it programmed to by-pass the pre-heat and stop at the end of mixing. When the dough reaches the right develpment for what I'm making, I take it out to ferment at an appropriate temperature. Im flattered that you got back to me so promptly...ooo and the added picture - truely flattered. Im suprised that the mixer you use has enough power.. can it do four pounds of dough? Also, how much water do you add.. and is it all in one addition.. Sorry Im driving you nuts.. 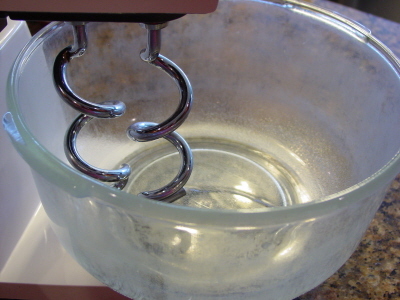 Most of the bread recipes that came with this mixer are for 3 1/2 to 4 pounds of dough, yielding 2 9x5" loaves. The bagel recipe, which makes a stiff dough is closer to 3 pounds, so that should give you some idea of what it can handle if you stick to the recommended mixing times. For someone like me, who isn't interested in making large batches, it's more than adequate, especially since I also use it to mix cakes, frostings, whipped cream, cheesecakes, cookies, quickbreads, and all manner of other things too. It has served me well for more than twenty years, however, I haven't done lots of bread for all of those twenty years. If bread is all you're interested in, and you want a work horse, I hear good things about the SP5. As far as water goes, how much just depends on the type of dough I'm making. And yes, usually all in one addition, although it depends on how familiar I am with the flour and how much water I know it will absorb. Congrats on your being able to bake alongside the master! I am surprised you have to ask if your bread sounding like rice krispies was a good thing, I still remember the first time my loaves did that like it was yesterday, even though it was a few years back now, I was all smiles ear to ear. It felt like it was one of the big platau one reaches in bread baking. Thanks! We were surrounded by crackling noises in class, and I knew that was a good sign of a crisp crust. But I was wondering how people view the apperance of the big cracks and scale pattern, so I threw out the question more as an informal poll. They remind me of my yard in the middle of a drought, but it's good to know that's highly prized around here :-) Blisters seem to be popular too, even if seen as a defect in some societies from what I understand. I must have missed that conversation. Funny -- Calvel is exactly who I had in mind when I posed the question. 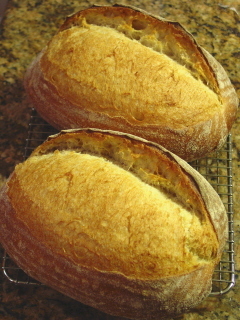 I too just took a class in Vermont with Chef Jeffrey H (advanced bread). Had a blast although Im sure I drove him mad with my pesky science questions, as he yelled at me quoting Calvel "The truth comes out of the oven!" but because Im a geek by nature and I need to undertstand so I can fall asleep at night...please please help me out if you can. From what Ive read bacteria takes much longer to do its thing (multiply/give off its byproducts) than yeast. The numer Ive read is 4-5 hours at 70-75 degrees for bulk fermentation (this can be shortened using a preferment). So firstly Ive hardly ever come across a reciepe that calls for a 5 hour bulk time - I guess its because unless its retarded the yeast will go nuts - unless you really just use a smigen of yeast and time it perfectly.. or use a preferment. Now Im not sure how this preferemnt injection works. It seems that when using a prefermnt the acid "flavor" is then just mixed into the dough like vanilla extract to a cake? I refer to flavor aspect alone (of course I understand that acid strengthens the protiens yada yada) but just from bacterial/flavor standpoint - is it just that the preferment has had the time to have this bacteria buildup or byproduct and we are injecting that flavor into the dough? Secondy, when we retard the dough in bulk to slow down yeast doesnt the bacteria slow down as well - or is there a magic number that one slows down more than the other leaving the bacteria to thrive? I guess now you know why Chef J was happy to see me go.. I'm giving you a reading assignment, because I can't answer that here, all in one post :-) And, it's a little off-topic for this thread. Actually, the bottom line is that bacteria grow much faster than yeast---yeast only start sooner. And, just because you decide the bulk fermentation is done, that doesn't mean the bacteria are. Your original post got me thinking about my own experience with differences between two identical loaves baked together. I have this happen with great regularity. So, I started paying closer attention and did an experiment. I often found that the loaf at the back of the stone had better oven spring and a darker crust. I thought that this was because it was the first loaded, when the oven and stone were hottest. So I got a Super Peel. This allowed me to load two loaves simultaneously. The loaves loaded together were less different, but there were still differences. I then noticed that, as you described, the loaf on the left was darker on the bottom and had better spring and bloom quite consistently. 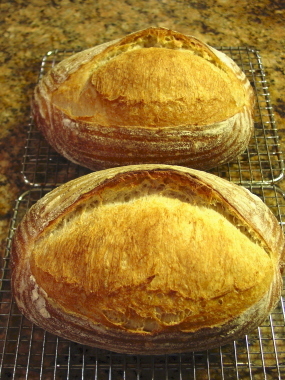 The loaf on the right seemed to open up less and often didn't form ears as well as the one on the left. This made me think that the right hand loaf got too much steam. Now, I was baking with my stone pushed to the left and my steaming pan on the right, so I could pour water into it without pulling out the lower oven rack. So, I moved both to the middle. 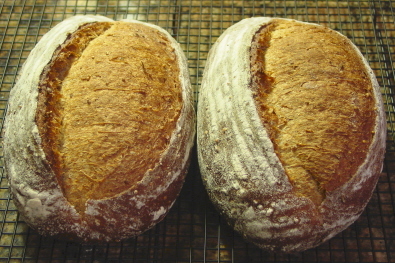 The result was that now both loaves had under-browned bottoms, but they had identical, albeit only modest, bloom and spring. My current hypothesis is that there are two factors operating. The first is that, when water is poured into the steaming skillet, the steam cools the part of the baking stone under it while the back left corner of the stone remains hotter. The second is that the right hand loaf can get too much steam, resulting in the cut flap of a bâtard to seal before it can form an ear. I would be able to verify the first factor if I had an infrared thermometer, but I don't have one. 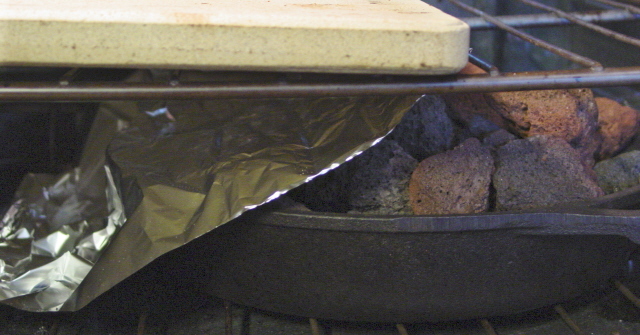 The loaf pan fixed the problem of the stone cooling. It is not as heavy as my skillet though, so I'm not sure it delivered the same amount of steam in the same amount time (I may need to add something weighty). Interestingly, now the loaf closest to the steam pan is ever-so-slightly larger and lighter, indicating to me, that there were no problems with too much steam. Sometimes the simplest solutions are the best, and this one was so simple it's almost MacGyverish. Aluminum foil. 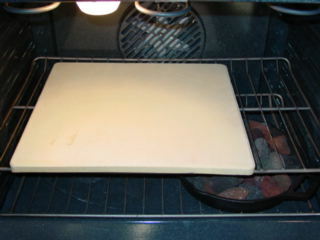 I hung a sheet from a rung on the oven shelf rack to make a flap that shields the stone and channels the steam in the direction I want it to flow. I think this closes the chapter on my steam problems. Edited only to correct spelling and puctuation. Mr Hamelman would be proud of those loaves and your discoveries, no doubt! They look fantastic, well done for thinking it all through. There is nothing that can match the thrill of a simple solution. I really like it. Deb, those are some fine-looking loaves! Hey guys, and thanks! Sometimes all it takes is determination. And a little aluminum foil---isn't that one of the best things ever invented? Added it to my McGyver file.... Thanks Debra! Very Clever! And another great photo showing the comparisons. Great thinking! Never did find an old cast iron loaf pan, but I know there's a roll of aluminum flashing stashed somewhere in the garage. 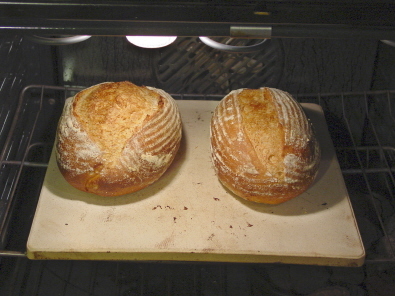 Since about all I bake in my oven is bread, might be fun to experiment with the flashing. Sorry for the confusion---I edited a spelling mistake, and that's what bounced it to today's date. I will add a note. So glad you did, since I missed seeing the foil diversion. I'm sorry for spamming commentary section this way, but I couldn't find any other way to reach you. I'm a journalist working on food/science project and I'd be happy if you aggreed for an interview. Could you please let me know at kuzminski@tygodnik.com.pl ? I'll reply with details (and don't hesitate to delete this comment afterwards ;) ).